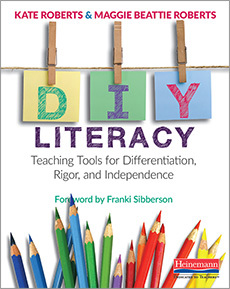 This is the last in a series of blog posts for the #CyberPD16 book study on DIY Literacy, Teaching Tools for Differentiation, Rigor and Independence by Kate Roberts and Maggie Beattie Roberts. This post will address chapters 5 & 6. You can read my previous posts here and here. Chapter 5 is all about differentiation. Kate and Maggie ask, “How can you make sure your teaching matches your kids”(p. 71) so that your relationships with students are not compromised? In other words, how can we sustain high-level teaching practices that generate vitality for us andfor our students? To me, these are powerful questions since teachers’ energy level in the classroom is often derailed due to a myriad other demands out of a teachers’ sphere of control. In order to provide some perspective on this issue, Kate and Maggie make an analogy between the scaffolding provided by yoga instructors and the role classroom teachers can play to address students’ individual needs. The authors describe the yoga tools (folded blankets while sitting to ease movement, blocks for keeping the body stable during certain positions, or ropes for stretching) used by instructors to allow all students to access the instruction provided. As reading and writing teachers we need to make similar supports (tools and strategies) available to our students so that they can access the instruction we provide. The yoga students choose from a variety of tools offered by their yoga instructor in order to perform challenging poses with the goal of eventually discarding these tools altogether. According to Kate and Maggie, “By giving students the tools they need, the instructor is helping the students to differentiate for themselves. It is no longer necessary for him to observe and directly teach each student in order for them to make progress,” (p. 72). It is our responsibility to provide a range of supports (tools) in the classroom to our students so that they can learn how to use them to further their learning. These supports or teaching tools (repertoire and process charts, demonstration notebooks, bookmarks and micro-progressions) assist students as they continue on their individualized learning path. One-on-one conferences or small group instruction then become a place for teachers to elevate student learning beyond what they are currently able to do alone. The instructional tools allow students to proceed along their learning path preventing them from becoming stagnant or bored as they wait for us to instruct them further. In a sense, teaching tools serve the role of surrogate teachers leading our students towards greater and greater independence. In the remainder of this chapter, Maggie and Kate describe several lessons that illustrate the main intent of this chapter: how to differentiate instruction for our students without creating 20, or more, different lesson plans. Teaching tools provide just-in-time support as students read and write freeing us up to address our students’ individual needs. The tools are stand-in teachers that students learn to use to enhance and support their learning. However, they are not meant to replace the teacher or to serve as props that hold up students temporarily or indefinitely. Consequently, it is important to continuously observe and confer with students to help them determine when they have internalized these strategies and don’t need the concrete, visual support any longer. In chapter 6, Maggie and Kate remind us that the purpose of these teaching tools is to address the multiple dilemmas associated with helping students remember what we teach them so that they can use it intentionally. By making instruction and tools vigorous (rigorous) enough to meet the individual needs of our students, teachers are able to address the issue of how to differentiate so that all students are able to access the instruction we provide at a level that is appropriate for them. The authors also provide words of encouragement and tips to those of us (me!) who feel challenged as artists and therefore may hold back from creating charts and other instructional tools. For example, they suggest selecting color combinations that can be used repeatedly for charts, such as always using black for titles. They also offer ideas for how to use space effectively on a chart by making the writing BIG so it’s visible from all points in the classroom; using simple icons over and over again to minimize the amount of text on charts; using capital letters if your handwriting is sloppy or illegible; asking for help from other teachers; and finally, ‘embracing our inner Picasso’. Although the ins and outs of creating charts may seem trivial, it is something that has previously held me back from using charts extensively and effectively as a teaching tool. I worry too much about how they look and fluctuate between creating them any old way and taking too long to do them in front of my students. Both of these approaches end up defeating my purpose, which is to create a tool that students will use and refer to as needed. In the end, I have often given up despite having observed my students struggle to apply a lesson because they can’t remember what we did and have no visual cues to help them. Thanks, Kate and Maggie, for taking painstaking care to write this book. I will keep it close as I continue to make plans for the new school year. Thank you to the #CyberPD16 group – administrators and participants, alike – for making this a memorable book study. I’d love to hear others’ reactions to these last two chapters or any part of DIY Literacy in the comments section below.